Lamps are available in so many different designs and shapes, that it can get really complicated to find a custom lamp. 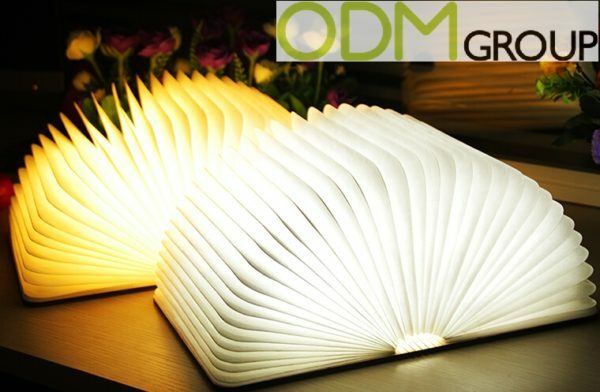 This is one new and unique suggestion for your marketing campaign, which will not only lighten up the room by its light, but also gain attention by its design as a book. To promote with such a unique promotional product is great not only to gain the attention to your brand, but also to gain your sales for a long term. This custom lamp design is a very unique way to provide the perfect mood for the perfect situation. This lamp is fold-able and works with a battery inside of it, which makes it very handy and transportable. Imagine siting with your loved one at a dinner in a restaurant or café and having this lamp to support the romancing mood you wanted to exist. This custom lamp is brand-able from the outside when it’s folded into this book design. And even though your brand is not always visible to the customer, he will still notice it, because of the easy handling by transport it from A to B and showing it to friends. Why should you think about such a Custom Lamp? Unique but effective. Such a lamp is not found everywhere. When you are promoting your brand with such a new, modern and unique custom lamp, you will gain a lot of attention and brand awareness. Practicality. The “pages” of this lamp provide a smooth light which is perfect for a relaxed or romantic mood and will appear to the satisfaction of your customers. The fact that you actually can close it back in again and transport it so easy makes this custom lamp to a really handy promotional product. This would be a perfect promotion for Restaurants, Cafés, Bookshops or Authors. At ODM we have significant experience in product design, sourcing and manufacturing. We can help you with your marketing budgets effectively. Be sure to contact us if you are interested in finding out more information about a Custom Lamp. Please find related links below.